The linear park covers approximately 5.3ha and is located at the heart of the redevelopment of Bordon. 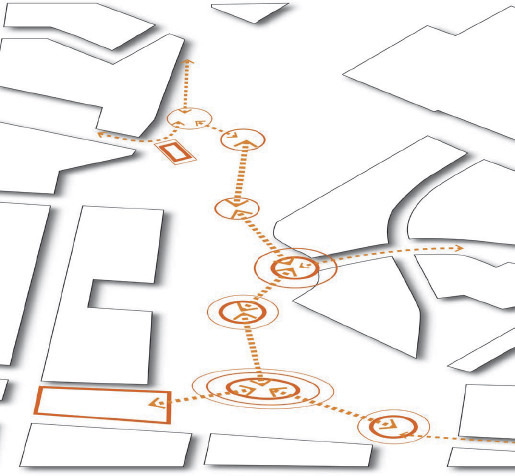 It is surrounded by development parcels but also serves as the connections of important key infrastructure. 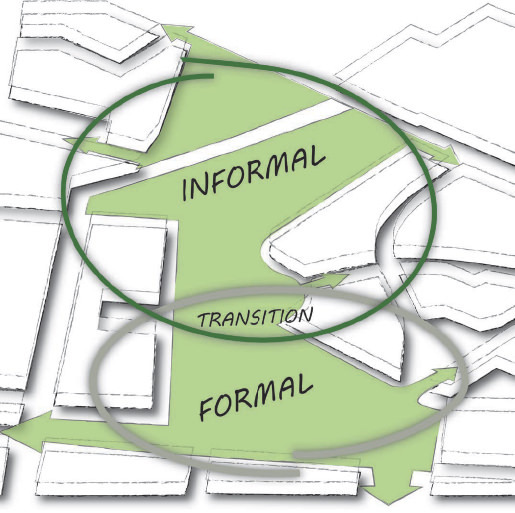 Refer to adjacent masterplan and below annotation. The Town Centre is located in close proximity to the linear park with proposed links through the space to the wider pedestrian network. The Oxney Drain watercourse runs through the centre of the linear park. 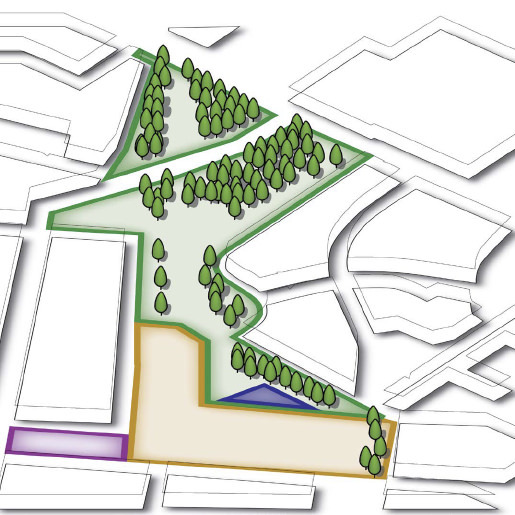 The initial vision for the linear park from the regulatory documents: design code, structuring plan and play strategy is to create a space that serves as a function space for the formal activities and form of the town centre with a gradual change to more informal setting of the woodland to the north. 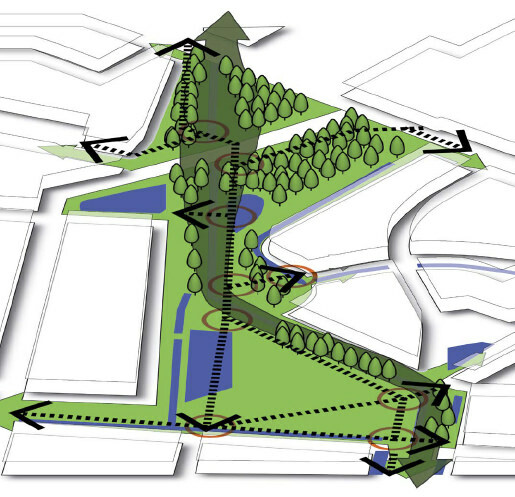 The structuring plan defines the linear park as a key space that can provide a link to sites past military heritage. 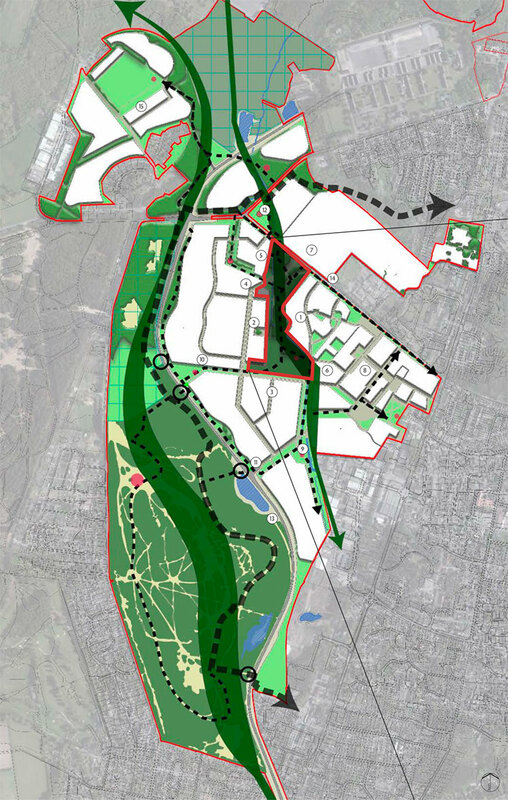 The linear park forms a vital link to the surrounding parcels and town centre thus becomes a hub that relates to the heritage strategy of the town centre and infrastructure. There are several buildings that have been noted within the design code as important feature of the existing site. This diagram shows the proposed functional arrangement of the park. Functions to include are a 1. wildlife orchard and community garden, 2. NEAP and LEAP 3. formal lawn areas for picnics and space for a cafe pop-up pavilion, 4. more informal woodland walks, recreation. The linear park forms an import green link through the scheme and connects into the green grid of Bordon. The current proposals of the Oxney Drain will provide a varied and bio-diverse habitat through the planting of native broad leaved trees and under storey with areas of marginal species and damp meadow grass. This corridor for wildlife provides a green back bone for the linear park. The park is suggested from the design code to be split between a formal southern section that provides spaces for play recreation, events etc. to a more informal woodland area to the north. The aesthetics of the design will incorporate this formal informal nature and the transition between the two through the materiality and planting within the park. 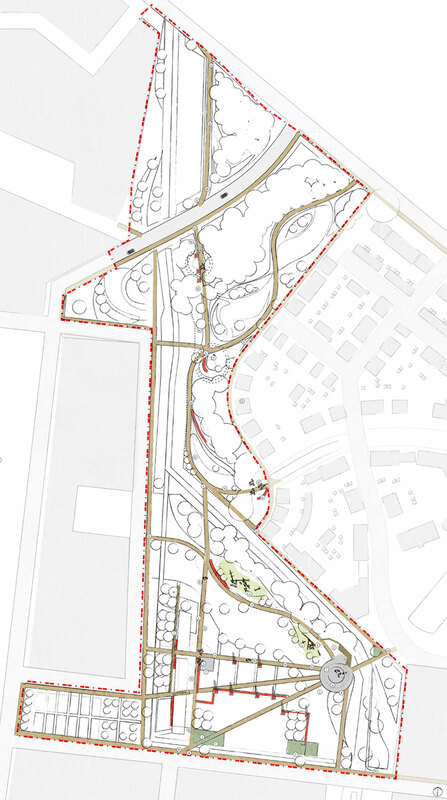 Materiality should reinforce the desired nature of the park with formal paths in Self-binding gravel to match existing paths from the Oxney drain proposals. The furniture should be hardwood with a simplistic modern design. The planting should include planting that is representative of local habitats, with sensory planting close to play area. There should be a degree of retention of existing coniferous woodland supplemented with additional structure planting. As part of the reserved matters application for phase 1 the Oxney drain formed an important ecological corridor. The Oxney drain flows north through the linear park creating a natural division. 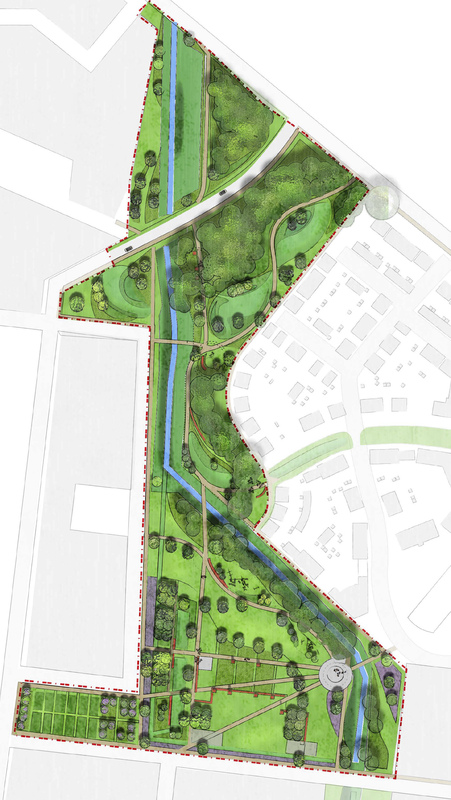 The overall design concept for the stream was to show a change in formality through the vegetation and design of the surrounding spaces, This green corridor will start formal near the town centre and phase 1 and gradually becoming more informal as the stream progressed through the linear park and out towards the ecological mitigation area. The proposals for Oxney drain encouraged natural regimes to take place akin to the order of the stream. Controlled access down to the stream is reinforced through planting and there are crossing through clear spanning Timber bridges in various locations. EPR’s Ecological Mitigation, Compensation & Enhancement Strategy for Oxney Drain describes the drain as a relatively modern feature arising from previous wet Heath land/mire habitat. With an act past in 1808 to enclose the area in forest to provide timber for ships the landscape changed into woodland. The alignment of the drain was then later changed later with the development of the Technical Training Area and the Prince Philip’s Barracks. 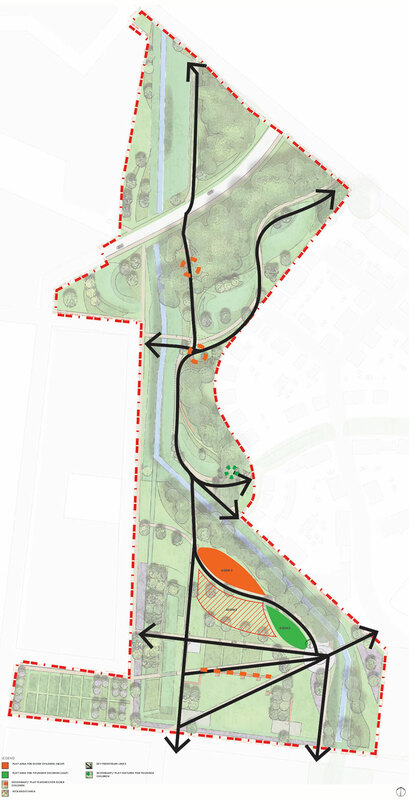 These proposals divert the stream back to it original alignment adjacent to phase 1 of the residential scheme. Basin planted with native marginal and shrubs species creating a dynamic mixture of colour and movement. Boardwalks crossing the basins at interface between copses and marginal planting. NEAP and LEAP adjacent to the Oxney drain corridor woodland. Primary circulation comprised of straight self binding gravel pathways. More informal woodland paths north of the Oxney stream. Red heritage line linking throughout the site. Taking on in places the outline of existing building. The design intent of the play provision for the park is to provide a balance between fixed nucleated play within the park to the south with more informal dispersed sculptural pieces and natural elements. By using natural elements to enhance play will not only help play to become part of its surrounds but also add extra play value to the play area. A LEAP or Local Equipped Area of Play is a larger area of play space with equipment providing a more prescribed form of play. The activity space will cover a minimum of 400 square metres with a buffer of 20 metres between the space and the nearest habitable dwelling. Where provided this play space will be located close to nearby properties with a maximum distance of 5 minute walk and cater for children that beginning to become independent and play away from home by themselves. LEAPs are to be positioned within larger open spaces ensuring there is an appropriate buffer to properties and they have good natural surveillance ensuring that children can play in these areas on their own and feel safe. A NEAP or Neighbourhood Equipped Area of Play is a large area of play aimed at older children. The NEAP is set away from development with a minimum buffer zone of 30m. Where provided these play areas are situated with a 15 minute away from properties. These areas may include a MUGA or an area dedicated to formal recreation measuring around 400m2. The equipment will provide at least nine different play experiences through out the space. These play spaces will provide key opportunities for socialising. Low level planting and swales will frame the play areas maintaining good natural surveillance, whilst also acting to provide a sense of enclosure. Providing play without defined boundaries will help children to view the whole landscape as full of potential play opportunities. Pieces for older children will focus on either providing enhanced motor skills or encouraging social interaction. The materials chosen will replicate the hard landscape present on site but will be softened by the use of more informal materials like self binding gravel and timber boardwalks. The play area will be situated with the backdrop of the Oxney drain the woodland character of the Oxney drain buffer will be evoked through the materials of the play area, use of timber for the play apparatus and bark for the safety surface. Two small areas of existing hard landscape concrete will be retained and elements of the old building will be retained upon analysis of ground conditions for contamination. Red/brindle block paving creating strong lines of red across meeting spaces and delineating between pathways and areas of congregation. Simple timber board walks to creating dynamic routes through damp areas and as viewing platforms over drainage basins. Granite set edge to self binding pathways within the southern area of the linear park creating a more formal appearance to the scheme. Areas of concrete retained based on ground investigation report and left as a link to the site’s past heritage. Pathways to consist of self binding gravel to match material that is being used throughout the Bordon redevelopment. Bark chippings as a safety surface beneath the timber play apparatus of the play areas adjacent to the Oxney Drain corridor. Within the more formal area of the park to the south concrete benches will be used to match the areas of retained hard standing. Some of these benches could be made with bespoke elements/engravings that relate to the sites past. Bins within the formal area of the park to be simple in form with a material that matches the existing concrete. Within the area that transitions between the north and south of the park the furniture will represent that transition combining more urban elements of concrete with timber elements. Timber bollards with spaces that require subtle lighting. Timber benches within the woodland spaces to the north will create a more informal appearance to this space. Timber bins to match bins proposed along the Oxney drain and elsewhere within the Bordon redevelopment. Timber bollards to control access to the space within the more informal woodland zone to the north. Concrete bollards within the southern area of the park to match the more formal nature and existing areas of concrete proposed to be retained. © Whitehill & Bordon Co.